There are many misconceptions about the nature of investing, and what it means to invest. As a Christian, I've found it to be a topic that’s often shunned and simplified to: "Don't be greedy". For much of my life, I held a strong stance that having investments (or even savings) was somehow equivalent to compromise. After all, shouldn't believers place their faith in God and not in mammon? We are called to invest everything we have with eternal purpose. It's also important to note that the biblical concepts of investing and money are not the same thing, though they are often intimately related. 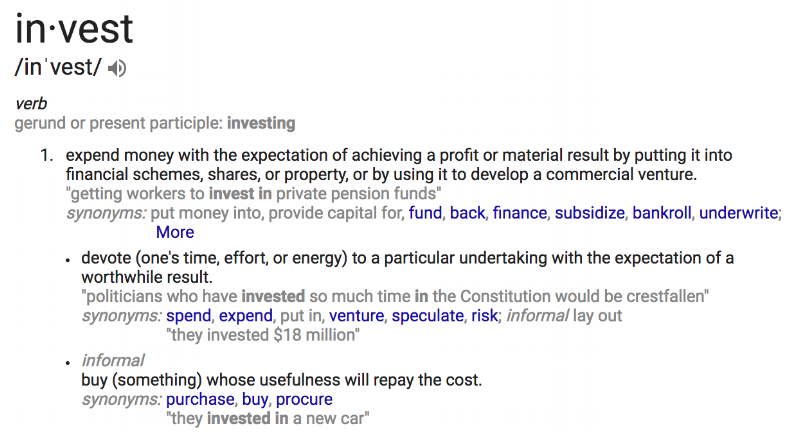 As seen in the above definitions, investing is an action that can encompass our use of time and energy as well as our use of money. Money itself is simply a medium used to capture physical "value". First, the classic “investing” example in the Bible comes from the Parable of the Talents. In Matthew 25:14-30, Jesus tells a story of a man who entrusts his servants to varying amounts of money (talents) with the expectation that they will earn more with it. One servant is given five talents (and this blog finds its namesake here! ), another is given two talents, and the final servant is given one talent. Though it's unclear the exact value of a talent (ancient measurements of weight have more variance), it was absolutely a lot of money. According to biblegateway.com, a talent was "worth about twenty years' wages for a laborer". When the master returns and evaluates his servants' results, he finds that the first two servants had 100% return on investment (the first one earned his returns specifically through trading). The last servant, supposedly out of fear, decided to bury his talent in the ground. The master rebukes him, saying, "… you ought to have invested my money with the bankers, and at my coming I should have received what was my own with interest." There is significance in the fact that they are each given a large sum in the beginning. Imagine that you are a wealthy business owner, and gave three of your managers initial capital of $5M, $2M, and $1M each to invest. Although you gave the first manager 5x more initial capital than the third manager, I'm sure you would still have high expectations for the third manager that was given "only" $1M. Much could be written about this passage, but the most straight-forward conclusion is that we are expected to be faithful servants, using the resources/time/skills that we have in order to benefit our master (God). For example, those with special abilities in teaching should take up positions to teach others, whether professionally, pro bono, or in the church, in order to bring God glory and win people to Christ. While parables are meant to be symbolic, I do find it somewhat confusing that many Christians do not apply the thinking behind this parable to the most immediate example available in the text: finances. There are numerous examples of believers who have used their businesses and wealth for the kingdom of God, from small mom-and-pop shops to huge franchises like Chick Fil A and Forever 21. They have taken their "talents" and applied them well for the Lord. However, there are very clear warnings in Scripture regarding the love of money. The two I want to highlight are below, though there are far more examples readily available in the Bible. Matthew 6:24 - No one can serve two masters, for either he will hate the one and love the other, or he will be devoted to the one and despise the other. You cannot serve God and money. 1 Timothy 6:10 - For the love of money is a root of all kinds of evils. It is through this craving that some have wandered away from the faith and pierced themselves with many pangs. Both of these examples point to the fact that turning our affections and our focus onto money is a truly harmful and sinful state of mind. Simply having money is not wrong in and of itself, and neither is making money. But the love of money leads to destruction. I have personally witnessed a family member utterly destroy himself in an ongoing attempt to get rich. He would constantly talk about the kind of charitable work he would do after becoming successful. I don't doubt that there was at least some part of him that genuinely desired that, but at the root of it all was a foolish greed that lead to poor decisions (attempts to get rich quick), and ultimately poverty. He lost everything, including his family. Please heed these warnings written throughout Scripture about the foolishness of seeking quick gain and becoming enslaved to the lust for more money. Financial investing can potentially be a great blessing to others, but it is also a path marked by many pitfalls. A litmus test I consistently use to gauge my heart is this: "Am I willing to surrender this to God? If He asks me to give it all up, or if by some circumstance I lose everything, will I still bless the Lord?" This principle can be seen in the stories about Job and the rich young ruler. Job was a righteous and wealthy man who lost everything (by no fault of his own). However, his first reaction to losing everything is still to fall on the ground and to worship. In the case of the rich young ruler, he is instructed by Jesus to sell everything he owns. He walks away sad, unable to follow through with this command. Our obedience to God must not be dependent on circumstance. To live for Jesus means being faithful to His call, no matter how difficult the ask, or how trying the circumstance. If God places on your heart to donate all of your wealth - stock portfolio, 401K, savings, property - can you still say yes? If there is another financial crisis and you lose a majority of the value of your investments, will you still rejoice in the Lord and trust in Him alone? The true intent behind investing must be for eternal purpose. In the end, any other motive will fall short. Whether we invest our time, energy, resources, skills, or wealth, all of it should point to building up God's Kingdom and serving His people. In such a way, investing in one's business or property or other investments is not morally wrong. Worldly wealth has been used greatly for the work of missions, aid for the impoverished, shelter for the homeless, clean water and food for the hungry, etc. But there are very real and present dangers to the accumulation of wealth, and this potential idolatry has lead many people astray, including church leaders. Ask the Lord for wisdom in how to invest, and continue to guard your heart against the enemy.